The Split-Vis car ferry is a vital transportation link between Split and the far-flung island of Vis. It runs daily year-round along with the Split-Hvar-Vis passenger ship which provides another way of accessing Vis Island. As you can see, the schedule makes a day trip impractical but you won't regret an overnight in fascinating Vis Island. If you're on foot, do check out the Split-Milna-Hvar-Vis catamaran. The Split-Vis car ferry is run by Jadrolinija. You can buy tickets online, at any Jadrolinija office or at a Jadrolinija stall in Vis or in Split. 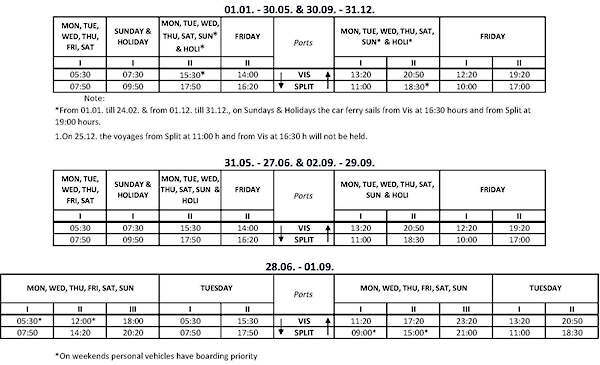 Click here for more information about booking ferries in Croatia.